This morning I woke up to the roar of waves and the smell of salt in the air. 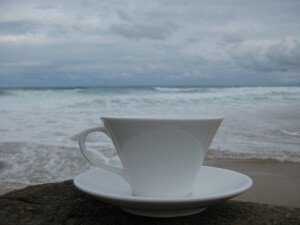 After just a few days “in the gong” I am acclimatised to my surroundings – a very welcome assault on the senses. My own rhythm falls in with the rushing of the waves to the shore. sense of urgency and a feeling that something is up, something is coming to a head. luminous to a dark teal which goes on for miles. In the space of a few hours, the sun, surf and sand are all a different colour. Kids play in the sand; digging, building, scooping. They bring more and more water to their trenches in buckets watching as it seeps into the sand – they continue their plight without tiring. There is a sense of glee in their movement and expression as they run back and forth from the frothy waves to their castle by the sea which is constantly licked and diminished by the encroaching tide. But I’ve never seen a sad face playing at the shore. Who knows what secret treasures they might find in a rocky crevice overgrown with iridescent green velvety seaweed? Even today, I love feeling that very seaweed between my fingers – it offers a smooth coolness and softness all at once. Almost addictive in that I don’t want to let it go – I want to keep holding it in my hand but reluctantly relinquish control and give it back to the sea. Just like those kids, I revel in my own childhood memories of collecting shells (the smaller and more delicate the better) and discovering darting crabs, tiny fish or even more exciting, a blue-ringed octopus! sun is busting through a thick cover of clouds and I look up to see the rays streaming down from what looks like heaven. What a blessing to see the sun light up the sky like that and radiate its warmth over the water for a few special moments. Over me, over the children, over the families sharing Easter together, over my family who are in fact oceans away. I climb up out of the rockpool and leave my troubles in the water beneath me as I hear the laughter of a small child. A sense of renewal – my cup is now full again.